One of the train cars slanted at a 45-degree angle onto Interstate 5 near Olympia. Others crashed into a wooded area nearby, according to aerial images of the wreckage. Twelve cars total went off the tracks. 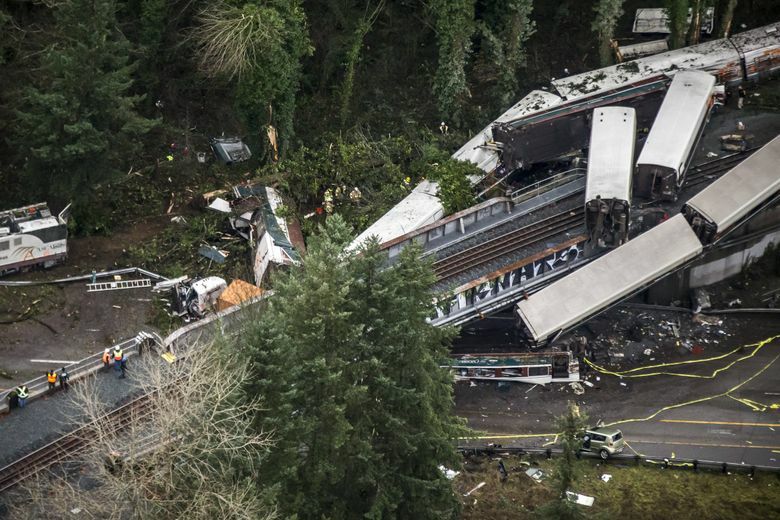 The precarious position of the Amtrak train cars that spilled onto Interstate 5 slowed first responders’ search for bodies and injured passengers, as large pieces of debris posed safety risks to them and to victims inside. Eric Waters, a Pierce County spokesman for the incident-management team, said a complete search of the crash site near Mounts Road, outside DuPont in Pierce County, ended hours after the 7:38 a.m. crash Monday that killed three people and injured scores more. The process included thermal-imaging technology to sense body heat of victims. One of the train cars slanted at a 45-degree angle onto the highway. Others crashed into a wooded area nearby, aerial images show. Twelve cars total went off the tracks. “Because of weather conditions and the conditions of the vehicles … it took us a while to stabilize the incident,” he said. 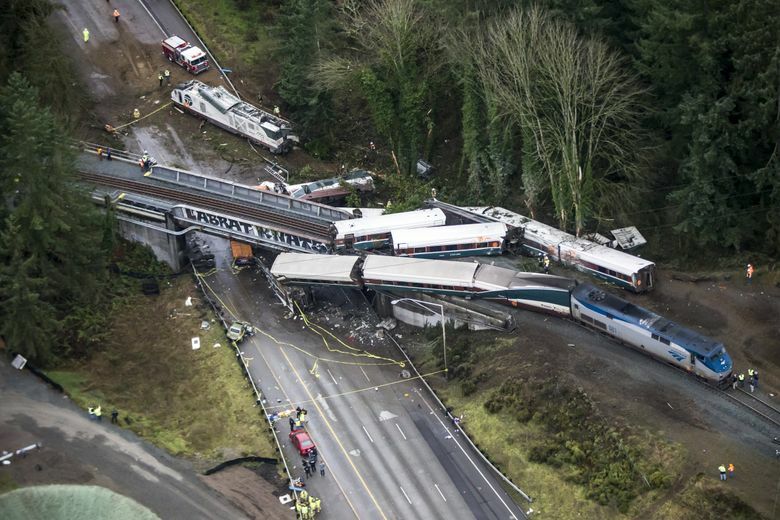 County and state agencies spanning Western Washington rushed to the Amtrak train-crash site minutes after the derailment, while passengers hurriedly escaped by breaking windows and pushing through debris. Drivers on the freeway immediately halted, some of them injured by falling train cars. Witnesses raced to pull people from the wreckage and give first aid. Washington State Patrol troopers were among the first at the site, helping people out of train cars and checking for injuries until firefighters arrived, Trooper Brooke Bova said. Fire crews immediately categorized the chaos as a massive, multi-casualty event and took steps accordingly, Waters said. Several firefighters walked the perimeter of the site to evaluate any potential hazards, such as dangerous materials or blockages, while others helped victims on the periphery, he said. That preliminary walk-around can take up to 10 minutes. “For a large incident, we know we’re going to be here awhile,” Waters said. Then, fire crews started a complete evaluation of the site, a secondary search, aiming to survey “every nook and cranny” with tools including cameras that detect body heat with infrared technology, he said. “Any source of heat — that’s a person,” Waters said. “That’s going to show quickly,” especially in Monday’s cool weather. But the tilted position of the Amtrak train cars delayed that search, as “big, heavy pieces of vehicles” hung precariously, threatening the safety of first responders and victims, Waters said. The effort in effect spanned hours. Dozens of people, both train passengers and drivers on the freeway, suffered injuries after the train — going 50 mph faster than the posted speed limit — went off the tracks. Those injures range in severity from minor scrapes to life-threatening wounds. Medics took them to hospitals spanning the region, and many remained hospitalized Tuesday. The State Patrol confirmed three deaths roughly nine hours after the crash, after both local and national media outlets reported a greater number of fatalities, citing The Associated Press. Authorities take special care before they publicly release information on deaths, a process that involves contacting relatives, Waters said. A fluctuating death total is common during emergency-response situations, sometimes because victims’ injuries are not easily discernible. “We see someone laying on the ground when they look deceased when they’re not,” Bova said. Among those who helped victims were a half-dozen soldiers who rushed from vehicles into the fray just after the crash, asking motorists for first-aid equipment, witness Greg Mukai said. Detective Chris Bailey, of the Steilacoom Public Safety Department, was one of the first officials on the scene. He said he saw a soldier climb up a train car that was dangling from the bridge to help people get out, as well as nurses and doctors exit personal vehicles — men and women in business attire appearing with latex gloves or stethoscopes.